Since the human food basket is approaching the green grass diet of our grazing animals, the cultivation of salad plants is becoming more and more important. Not only should we strive for a large variety of salad plants, but we should grow them with a nutrient supply which will assure us of an adequate supply of minerals. It is unfortunate that we can grow very good salad plants in appearance that may be deficient in vitamins and minerals when used for human food. For instance, a spinach plant, when properly grown, should contain in its tissue 4000 parts per million of calcium, but when we look over the analysis sheets of a large number of samples, we find the calcium content may vary from the maximum down to less than 100 parts per million. Let’s examine some of our salad plants. Some are readily recognized and are commonly grown. 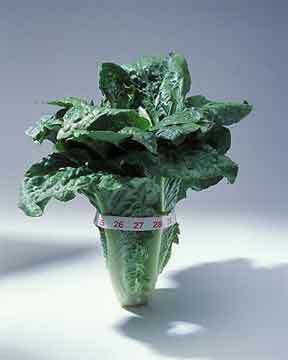 Among these may be mentioned lettuce, both head and leaf, escarole, endive, chicory, Chinese cabbage and celery. However, these are only a few of those that can be used. Many plants are used in different parts of the country that are not even cultivated. As a matter of fact, as we learn to recognize those plants and know their vitamin content, I wonder whether we are justified in eliminating any vegetables from the salad bowl. There certainly are few limitations to the vegetables that can be included in the tossed salad. And we can, if we would improve the salad still further, include many of our weeds. From the standpoint of good health we can assume that the greater variety of plants that we can include in the salad, the more nearly will we come to supplying a completely adequate vitamin pill. I have been told on good authority that there is a school of thought which states that most sufferers of common “misery”, “rheumatism” or “arthritis”, would be greatly relieved of pain if they would make the salad howl the nucleus of their diet planning and would keep that bowl filled with as great a variety of vegetables as it is possible to get. I am glad to see more attention being paid to the balance between vitamin foods and those highly concentrated high-energy foods. I don’t believe it is necessary to become fanatical in this. but there is plenty of room for improvement in our potato and gravy diet. Our green and highly colored vegetables are high in vitamins. Our white vegetables are more valuable for their mineral content. Many of our plants have specific compounds which have beneficial effects inhuman nutrition. Then there are also harmful alkaloids and similar compounds which are had and which make some leafy plants unfit for salad purposes. I don’t believe any person or any insect outside of the tobacco worm would find leaves of tomato. potato, egg plant or pepper very palatable. Poke weed salad or cooked as a pot herb is a possibility that few people know about. Lamb’s quarters, pigweed, many leaves from leguminous plants like peas and beans and milkweed sprouts which are sought after by asthma sufferers, as well as many others such as ferns, usually better when cooked, are available and used freely in some sections. The fact that we classify our vegetables into salad, pot herb, fruit, tuber, root, and cole crops, is no reason for assuming that they must be used for purposes indicated. Sweet potato sticks from some of our highly flavored Puerto Rican and Cuban yams are as palatable as carrot sticks. I was surprised to find sweet corn cut from the cob and served raw in a salad, and I suppose it did me more good than if it had been boiled to destroy the vitamins and leach all the minerals into the liquid. If we can’t prepare our cooked vegetables without leaching out their mineral content, we would protect our health far better by eating them in salads where even such plants as broccoli, cauliflower, turnip greens, young kale leaves and dandelion greens can be made palatable. With such a point of view on what are salad plants, a discussion on cultural methods must of necessity be general. There are certain things that we can do to insure us nutritious vegetables. Let’s be sure that our soil is properly limed. Let’s use magnesium limestone for this purpose to supply both calcium and magnesium. The amount depends on the kind of soil and the depth that it is dug. The deeper we can prepare the soil, the better, and incidentally, as we increase the depth of the topsoil we should add more limestone. The more thoroughly the limestone can be mixed with the soil, the better. Sandy soils need only .50 pounds to 1000 square feet, but heavy soils may need 50 pounds. The fertilizer required cannot be recommended accurately. For most salad crops I would put on 9.5 pounds per 1000 square feet and mix it thoroughly with the soil. If more is needed, it may be dissolved in water and applied in solution along the row and around the plants.